Archibald Cameron Corbett: The Man And The Houses is a documentary about the man who created the Corbett Estate. 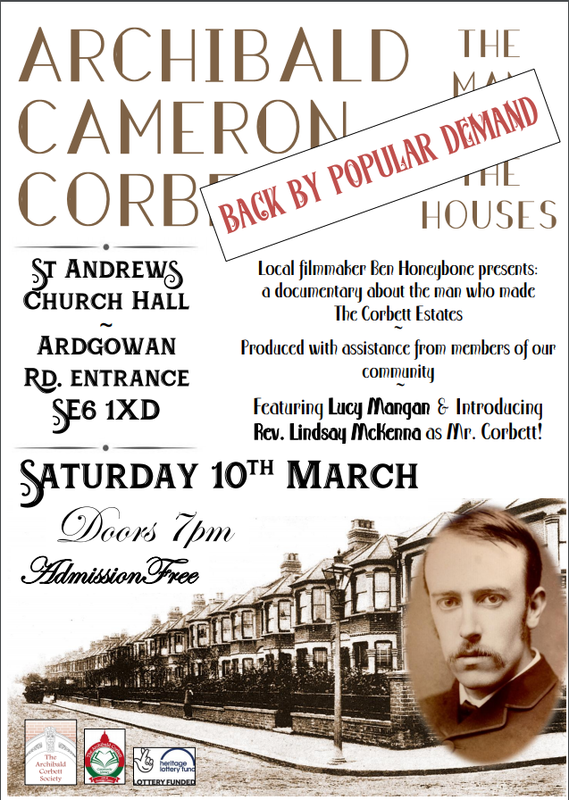 Presented by author and journalist Lucy Mangan, and featuring Catford’s very own Father Lindsay McKenna as Archibald Corbett, the film provides an insightful and comprehensive account of the man whose vision created huge housing estates in east and south east London around the end of the 19th century. It begins with Archibald’s formative years in Glasgow and a teenage tour of the continent in the 1870s, and follows his journey to Parliament where he campaigned on some of the biggest social issues of the day. The houses, of course, play a huge part, with Corbett’s ‘healthy living’ philosophy informing the construction of nearly 10,000 of them across seven estates. The film had its inaugural screening in Catford on Saturday 20th January 2018, and has had a number of screenings in Eltham, Ilford and beyond – all to glowing reviews.